In our test scenario, we simulate the common situation where users rely on the anti-phishing protection provided by their security products while browsing the web (and/or checking their webmail accounts; anti-spam features are not considered, as they are not within the scope of this test). The test was done using Windows 7 Professional 64-Bit and Internet Explorer 11 (without its built-in phishing blocker, in order to get browser-independent results). All security products were tested with default settings and in parallel, at the same time and on the same URLs. The test took place between the 7th and 14th July 2016. Phishing URLs were tested as soon as we discovered them. All phishing URLs had to be active/online at time of testing and attempt to get personal information. After removing all invalid, offline and duplicate (sites hosted on same server/IP) test-cases, 531 valid phishing URLs remained. The phishing campaigns targeted various types of personal data, including login credentials etc. for PayPal, online banking & credit cards, e-mail accounts, Dropbox, eBay, social networks, online games and other online services. The set of legitimate online banking websites consisted of 500 clean URLs. 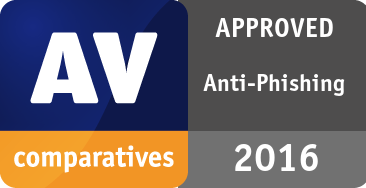 In order to be approved by AV-Comparatives for Anti-Phishing Protection, at least 90% of the phishing URLs used must be detected and blocked, without causing any false alarms with legitimate online banking sites. Only products which were submitted for the Anti-Phishing Test, and which passed the test, are listed in this report. Other vendors can reapply for approval in 2017. Below you can see the percentages of blocked phishing websites (size of test set: 531 phishing URLs). The map below shows where the phishing websites used were hosted, based on their IP addresses. For the anti-phishing false-alarm test we selected 500 popular banking sites (all of them using HTTPS and showing a login form) from all over the world, and checked if any of the various security products blocked these legitimate online banking sites. Wrongly blocking such sites is a serious mistake. Of the three products listed above, there were no false alarms with the tested 500 legitimate online banking sites.